?I’m sure you all know how it goes: He spins a web any size. He catches thieves just like flies. He even has radioactive blood, bud. Wallopin’ web-snappers! Is your spider-sense tingling? Mine sure is. Because of all the translations of everyone’s favorite web-headed hero from comics to screen over the years, none has so faithfully and successfully captured the magic of Spider-Man as the 1967 animated series produced by Grantray-Lawrence Animation. and Lee! ), Parafino, the Fifth Avenue Phantom, and the invisible Dr.
Noah Boddy (how clever!) were memorable foes in their own right. The second and third seasons… well, things got a little psychedelic as the cartoon came under the guidance of Ralph Bakshi, but overall it was still a heck of a good, web-slinging time. 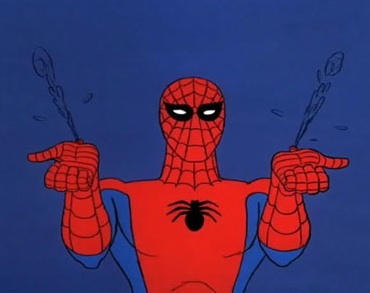 If you’re a Spider-fan and haven’t watched this classic Marvel cartoon, you owe it to yourself to give it a try; it’s currently streaming on both Netflix Instant and Marvel.com. If you don’t have time — like, say, if you have two full-time jobs as a superhero and superhero photographer — why not check out just the 10 best ’67 Spider-Man cartoon episodes here? While investigating a series of “mystery lights” outside the city, Spider-Man discovers the secret lair of Dr. Octopus. It seems that old pie-face has his warped sights set on destroying Manhattan. Why? Who knows? Perhaps he lost the latest Roy Orbison look-a-like contest. The episode illustrates how well the series maintained Spidey’s sense of humor and knack for one-liners. When he gets the drop on Ock, the villain shouts, “Spider-Man! No one can interfere with my plans!” Without missing a beat, Spidey retorts, “Looks like I caught you with your plans down!” Nevertheless, Ock manages to one-up Spidey and imprisons him in a reinforced steel cage. And like all good evil geniuses, Ock keeps our hero alive so he can view his grand plan of destruction come to pass. Meanwhile, a concerned Betty Brandt foolishly goes searching for the overdue Peter Parker which, of course, only leads her to be captured by Doc Ock too. But it does provide Spider-Man with the diversion he needs to escape from his prison and take on the eight-armed menace in his imitable web-slinging way. This marks the first appearance of Dr. Octopus in the series and is a great example of a simple story set-up and action that makes the series such breezy fun. A bank in the heart of Manhattan disappears by way of slipping deep into the ground. Spidey goes below to investigate and swings his way through a barrage of nightmarish landscapes. It isn’t long before Spider-Man nearly becomes a snack for a horrific pterodactyl-type-thing and encounters a Harryhausen-like giant guard before he finally discovers a city inhabited by hairy blue ape-like humanoids (they are referred to as “subterranean mole-men” but I’ll be damned if they don’t look like apes to me). Spidey sneaks inside the main hall and karate-chops a couple of mole-men guards in the back of the neck — sending one of them plummeting off the side of a cliff to his death — and then learns that their mask-wearing leader is actually a criminal called Mugs Reilly who has tunneled out of prison and disguised himself as a mole man leader. When all is revealed, the angry mole men restore things back to normal and Spidey has saved the day again. What makes this a stand-out episode? Spider-Man is battling blue ape-looking creatures, ’nuff said! Just check out the way they charge when they attack! Now that is groovy animation! How is it, despite a completely ludicrous costume consisting of green and yellow jammies and an impractical starfish-shaped mask, Electro manages to still emerge as such a great Spider-Man villain? Even old Jameson calls Electro a circus clown upon seeing a photograph of him. Nevertheless, the lightning-throwing baddie puts the web-slinger through his paces in his debut appearance here. He begins his crime wave by breaking into Jameson’s apartment and blasting open the old skinflint’s wall safe, which of course ihe immediately blames on Spider-Man. The final showdown takes place at one of those conveniently abandoned amusement parks that are so abundant in the realm of superhero stories. Following a treacherous ride on a runaway rollercoaster and walk through a deadly funhouse, Spidey finally bests Electro’s flashy powers by using a special asbestos based web fluid! It’s another terrific episode that benefits from a distinct comic book feel. The Rhino is revealed here as little more than a rotund narcissist who is knocking over trucks and vaults to obtain enough gold to make a statue in honor of his “fame and strength.” This episode is so pleasantly amusing it had to be included here. It was a tough choice, as in the previous Rhino appearance Spidey felled the massive charger by attaching an economy-sized can of pepper to his horn and causing a sneezing fit, but I just love the Rhino’s hair-brained scheme in this one. Get over yourself, tubby. And though he may be low on brainpower and motivation, the Rhino is effectively made out as a force to be reckoned with. He smashes through the side of buildings, slams into motor vehicles and even charges a train head-on, destroying it with nary a headache. It’s an endearingly dopey affair that’s good fun to watch… especially when the Rhino stomps his foot upon the ground before charging. Judging from the strange helmet he wears, the series appears to have used the Blackie Drago version of this classic Spider-Man villain as their model template. This time out, the Vulture is using a clock tower conveniently located across from The Daily Bugle as his hideout. The decrepit old clock is constantly on the fritz, chiming endlessly at the wrong time and displaying the wrong time. Fed-up with the malfunctioning clock, concerned citizen J.J. Jameson investigates, only to be captured and used as a source of information by the Vulture to plot his crimes in which he obtains “trinkets to feather his nest.” Of course it’s Spidey to the rescue, much to Jameson’s chagrin. Something about Spidey and the Vulture doing battle in a clock tower with J.J. caught in the middle is just wonderful. gives nice insight to his stalwart character. The world’s greatest stunt man — who alarmingly looks a great deal like Mr. Spock here — uses his specialties to first double as Spider-Man while committing a string of robberies to incriminate him, then after transforming himself into Mysterio, the fishbowl-headed, super villain we all love, he goes to J.J. Jameson with a proposal that the arachnid-hating publisher can’t refuse: He offers to destroy Spider-Man (for a price). Jameson agrees of course, and Spidey finds himself battling the masked menace on top of the Brooklyn Bridge. After getting the upper hand in the confrontation, Mysterio escapes, but Spidey tracks him to his home base of operations in a television studio. They duke it out in a classic finale on an old-time western saloon set while an exuberant director declares, “Stupendous! Colossal!” And that’s what makes the episode so much fun, watching Spider-Man and Mysterio trade blows in a knock-down, drag-out finale. It’s the dead of night inside a darkened prison. An invisible assailant knocks the only guard on-duty unconscious and proceeds to release The Green Goblin, The Vulture and Electro (all of whom are inexplicably in their costumes) from their cells. It’s the handiwork of Dr. Noah Boddy and he is hungry for revenge against Spider-Man. His master plan entails banding together with these arch-villains to destroy Spider-Man once and for all — and they nearly succeed, blasting away at Spidey with new and improved pumpkin bombs and a series of concussion missiles that rather magically appear from the Vulture’s wings. Of course, all these super-villains are power-hungry egotists, something Spidey slyly uses to his advantage to win the day… along with a little dose of voice impersonation. Didn’t know that Spider-Man possessed those skills? Best not to worry too much about it. This is a particularly fun episode as it’s pretty cool to see Spider-Man take on “an economy pack” of bickering super villains, as he so eloquently puts it. This gem is based on a pair of classic Amazing Spider-Man comics in which Dr. Stillwell creates a genetically altered madman in a scorpion suit on Jameson’s behalf to crush Spider-Man. The Scorpion is a monster, hollering and taking delight in the destruction of everything in his path. Most interestingly, Spidey captures him once… only to have him bust instantly out of jail and come after him and Jameson again. Strangely, The Scorpion fears nothing… except the police, the very mention of whom sends him into a panic. It’s pretty funny. This episode is particularly great since the Scorpion is such a frightening and relentless adversary, and it’s chock-full of action. And any episode that features a cowering Jameson as his office is ripped apart by Spidey and a supervillain as they duke it out is a winner. The Green Goblin is debatably Spider-Man’s greatest foe. He was put to good use in this cartoon series as a nefarious weirdie and this episode is a great example. The Goblin is bent on raising a band of demons to give him unlimited supernatural powers, which requires an ancient arcane spell located in the library of Blackwell the magician. Spidey interrupts the burglary, but the Goblin gets the upper hand by way of some “gremlin dust” and manages to swipe the spell book and the scepter of Osiris. The Goblin requires a medium to guide him through the demonic resurrection ritual and that pawn turns out to be none other than… J. Jonah Jameson! The final showdown fittingly takes place at midnight in a cemetery with ghosts bubbling forth from Gobby’s cauldron. I found this to be a deliciously spooky episode when I was a kid. What also really works about this episode (as well the others featuring Gobby) is that the crimes he perpetrates involve a touch of magic and the supernatural, making him an interesting and unique adversary for Spidey. While this incarnation of the Goblin is both kooky and creepy, there is something seriously unsettling about him as well.